Where do I find Pubs? Despite the presence of the number 4 tram route, Utrechtsestraat is quite a backwater. Countless small, specialist shops crouch along its length. And more good pubs than even the greatest optimist would expect. I hope that they won't be ruined now that I've drawn attention to them. I was prompted to explore here by the frequency of mentions in the "Mijn Amsterdam" column of Het Parool. 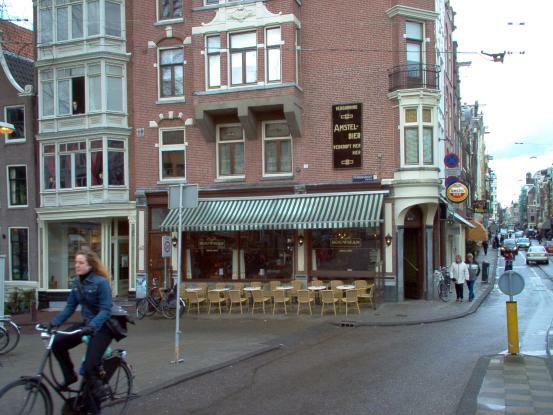 Around half the correspondents named a café on the Utrechtsestraat as their favourite. Now there has to a reason for that, doesn't there? Every Dutch breweries and all their beers. Detailed tasting notes of many Dutch beers. 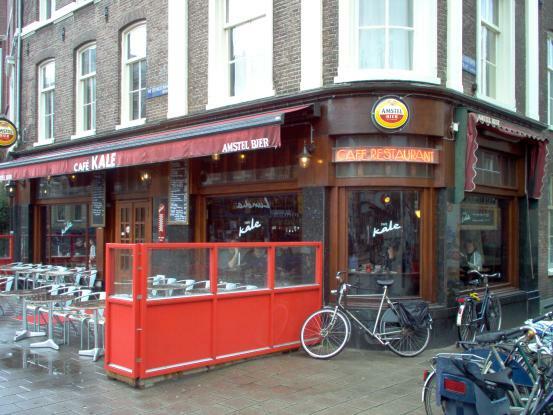 Prices: Pils �1.80, Duvel �3.20. 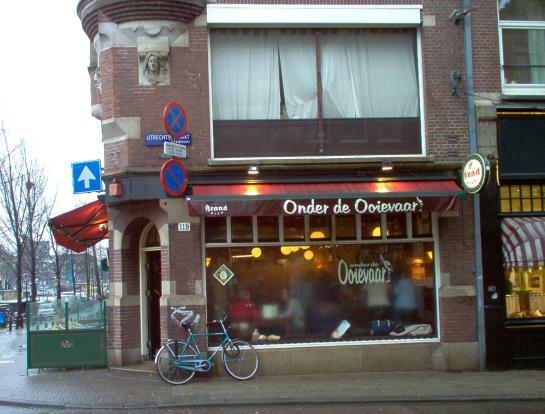 It may be stuck right at the far end of Utrechtsestraat, but Oosterling is well worth the trek. Those who can be bothered will be rewarded with an unspoilt locals' pub. Oosterling is one of a very rare breed - a bar that still has an off-licence. Or a Slijterij-Tapperij as they call them in Dutch. The authorities took against the concept some time ago and stopped issuing new licences. The numbers are wittling away as landlords retire. 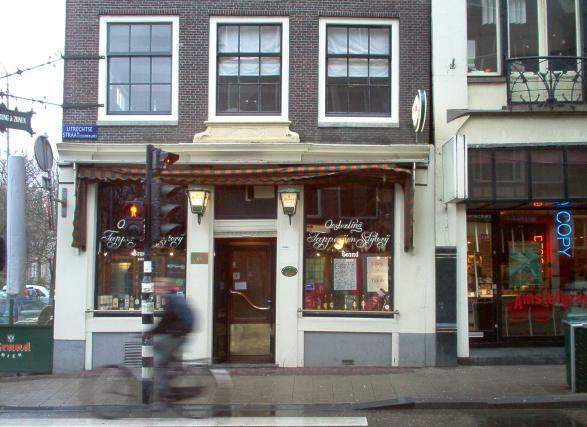 Amsterdam is now down to a mere handful of such establishments. A low bar occupies the whole of one wall. It's quite nicely carved, though not too extravagantly. At the door end it serves as the counter of the small off-licence section. This consists, so it seems, entirely of spirits. So perhaps I can understand the council's lack of enthusiasm. Are you a copper, brass or zinc person? Well, Oosterling goes for the most obscure - and it my opinion the most decorative of the options: copper. Very cosy and welcoming. But enough of how they look - I bet you're wondering what comes out of them? With four Brand beers, I think we can assume that there's some sort of tie thing going on. I had heard that Brand had drastically pared back its range, so it was quite a shock to see Impeartor, one of the supposed victims. In addition there's De Koninck and a "beer of the month" - Westmall Dubbel when I was there. Though it's a decent-sized pub, there aren't a great number of tables. Perhaps that's so the delightful mosaic stars are more visible. I've always been a sucker for stars, no matter how many points they have. As you will be able to see to the right, if you pick a table at the window you'll be sitting under an impressive row of old spirit barrels. Rather you than me. I've always been of a nervous disposition. I'm sure that I've told you this before, but remote locations do have their benefits. Look, I've nothing against tourists, but it is occasionally pleasant to sit in a genuine Amsterdam atmosphere. Oosterling certainly has that. And no music. Listening to the locals chat about the monarchy ("an anachronism" was the conclusion) and the progress of their redecorating (still not finished) while the rain steamed up the windows was a soothing start to my Saturday. I'm sure it works just as well on any other day of the week. Food: Snacks �2-7. 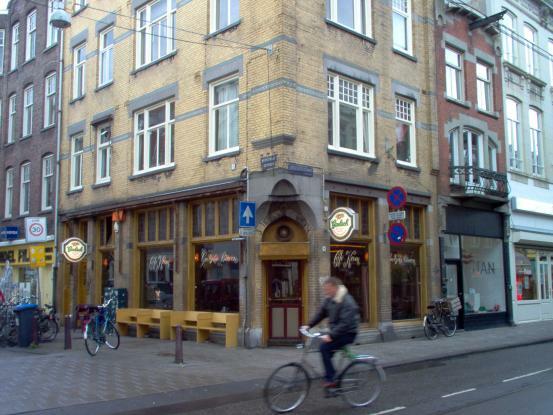 Beer vaasje Pils �1.80, pint Pils �3.60. I didn't time my visit to Onder de Ooievaar very well. They had run out of Paasij the evening before and hadn't got a new supply yet. Oh, alright, I'll just have to make do with Columbus. Spoilt for choice. Lucky bastards. That's my opinion of those lucky enough to live around the Utrechtsestraat. As if just one cracking pub (Oosterling) wasn't enough for them. OK, Ooievaar is very different in style - light, airy - but still has a relaxed and relaxing atmosphere. A place where you can sit and read the newspaper. Or have a quiet chat. There is music, but soothingly Cuban and played at a volume that still allows conversation. My god, civilisation isn't quite dead yet. The big windows on two sides do give a shop-like air to the place (before it became a pub in 1953, that's exactly what it was). And it's mostly filled with yuppie-ish twenty- and thirtysomethings. But don't they have to hang around somewhere, too? (Don't suggest the bottom of the harbour, please.) I didn't find them too obtrusive. The pub's name - "Under the Stork" - comes from a tile mosaic on the corner tower, which portrays a stork. This was put there by an insurance company from Den Haag that once owned thye building, the bird being the symbol of that city. The small list of bottled beers does include four from Het IJ. So, go on. 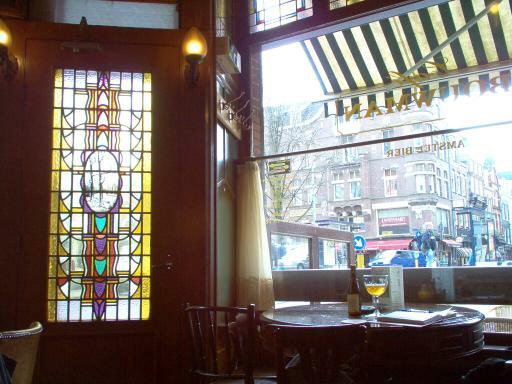 Drink a real Amsterdam beer in a real Amsterdam pub. 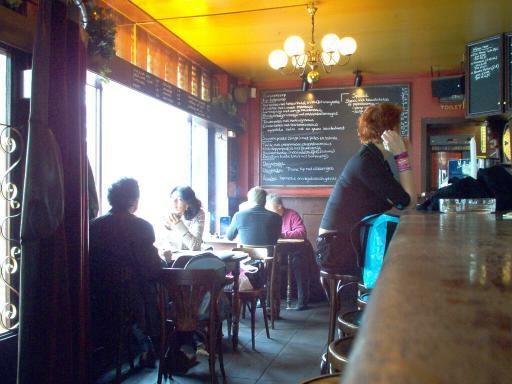 Mulder is a typical old-fashioned, single-room, corner pub. Take the number 24 or 25 tram and you can't miss, on the far corner of Vijzelgracht. 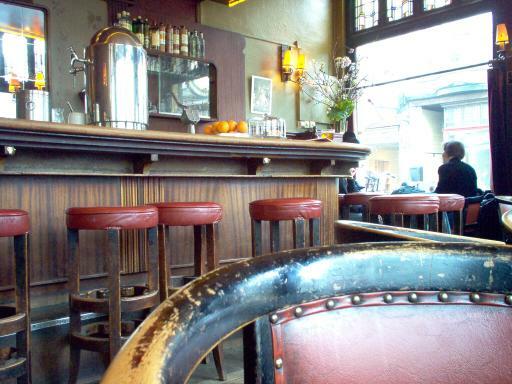 The elegant bar counter and bar back look pretty original - I would guess that the building dates from around the 1880's The large windows have discreet but decorative leaded lights that are one of the few touches of colour other than brown. What about the view? Well, from the front you get an excellent view of the former Heineken brewery. The side windows allow you to observe the giant hole being dug for the new Noord-Zuid metro line. Don't going to be down here soon? Don't worry - they don't plan to be finished before about 2010. You may be able to notice on the photo to the left the tile picture of Dam Square. I'm not quite sure why it's there, seeing as the Dam is quite a distance away. 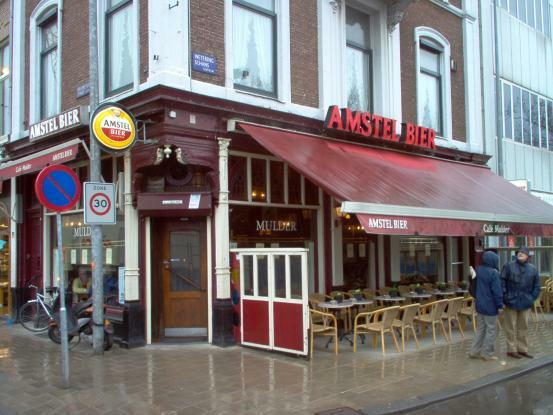 I'm still trying to work out why all the pubs within 200 metres of the Heineken brewery sell Amstel. I know they're part of the small multinational, but it's still a bit odd. The beer selection isn't great and, as already stated, Heineken tied. The fussy amongst you will have a choice of Westmalle Tripel or Duvel. I was very pleased to notice that they have that good old traditional pub snack, the boiled egg. Not much else to eat, But, hey, this isn't a restaurant, it's a pub. 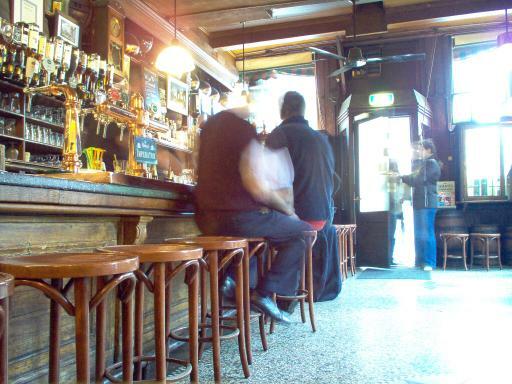 I'm still regularly pleasantly surprised by Amsterdam's pub scene. While simple, unpretentious cafés like this survive in such numbers, I'll pass on the razor blades. Rating: *** Public transport: Tram 24, 25, 7, 10 to Weteringscircuit. Food: Snacks �4-6, meals �10-16, La Chouffe �2.70. I recognise those red and blue geometric designs. Another from the mad light-leaders of Amsterdam. The large terrace might lead you to expect a more spacious interior. It certainly had me fooled. Yes here's another pub that's been on my "to do" list since facial hair was last fashionable (that had to be a long time ago, didn't it?). Corner pub, dark red walls, half panelling, tield floor, plain wooden bar, simple mirrored bar back. There's the boring descriptive bit out of the way. That wasn't too painful, was it? You don't need to know any more. Oh ... yes, they have unusual plain brass beer taps that, frankly, look a little shabby. 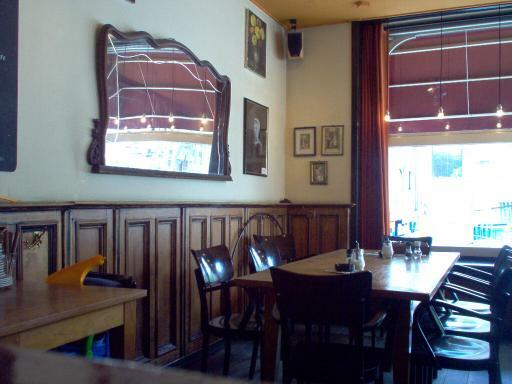 It has a very Dutch atmosphere, something not always that common inside the grachten gordel. Here the customers are of the well-heeled variety. Fortysomething ladies doing lunch. Yuppie couples staring wistfully at one another over their salads. You get the idea. Scruffy it isn't (if you forget the beer taps). Certainly not a ghetto (unless that's midddle-class ghetto) bar. One down side is that it's very much an eetcafé. So, during eating hours, expect to have to sit at the bar if you just want a beer. The beer list isn't huge, but there is draught La Chouffe at a very reasonable 2.70 euros. The bottled beers are a lineup of the usual suspects - Westmalle, Duvel, etc. Rating: ** Public transport: Tram 7, 10. I like Utrechtsestraat. It's how I imagine Amsterdam was 30 years ago. No cheapo chain shops and crappy fastfood outlets here. The physical similarity with the Leidsestraat - single tram track with stops on the canals - only emphasises the cultural chasm between the two streets. I'm wandering off topic again. You're waiting for me to tell you what this pub is like, not listen to my musings on the vagaries of urban development. 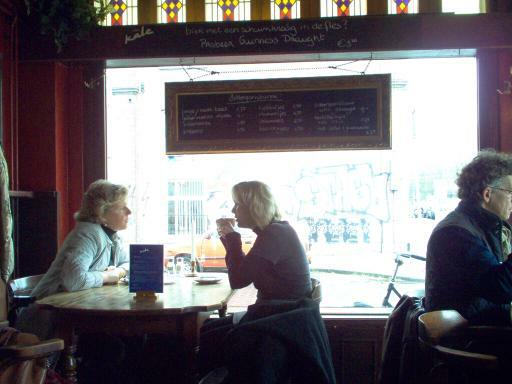 Along with the specialist shops, Utrechtsestraat is also rich in watering holes. Look closely at the rather pretty photo of Bouwman's leaded glass door and you'll be able to spot Onder de Ooievaar in the background. That's how I like my pubcrawls - without too much walking. 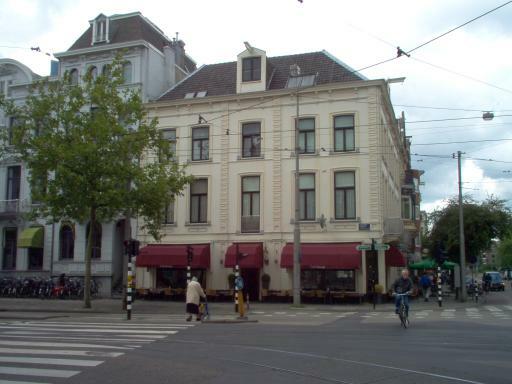 Bouwman is in a very similar corner building from around 1900. A very attractive style of architecture, if you ask me. 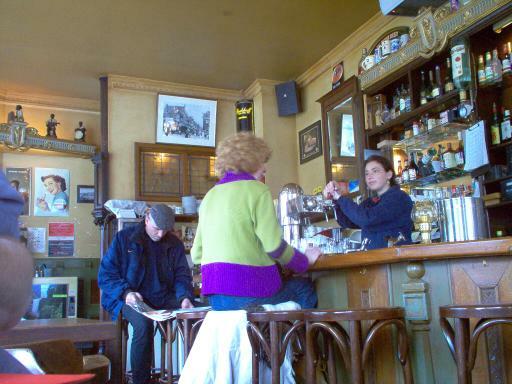 It has a low, partly green-painted bar counter. That's always a good sign. No-one has built this type of counter in the last 50 years. This particular design, with alternating painted and carved panels, is new to me. I'm pleased that so many pubs have left their leaded lights in place. The ones here are similar to those in the houses opposite where I live. But the highlight is the door. I've included a photo so you don't have to rely on my pathetic powers of description. Old Amstel adverts are brilliant. They have a nice cheesy 1950's poster, that you may be able to spot over the shoulder of the bloke in the flat cap, on the wall here. I suppose that a continuing netherlife as a Heineken brand helps to keep this stuff hanging around. But just look at that door. I'm pleased that my new digital camera enables me to capture this sort of magic. Careful observation will reveal my beer choice, too. Beer - oh yes, you're probably interested in that, aren't you? What you would expect - Duvel, a pair of Westmalles and a couple more. No, nothing very special. But tell me that Westmalle Tripel and that door aren't both world class. Rating: **** (plus 1 for the door) Public transport: Tram 4. When affection turned into unequivocal love, is how I would describe setting foot in Krom. Taste is very much a question of fashion. Some periods only garner distain. Loathed, they crawl off and die quietly. The 1950's did. 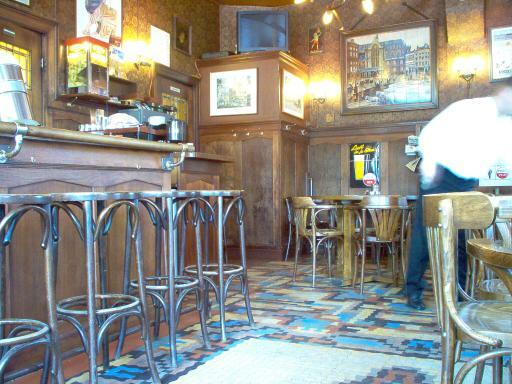 The barman - a thoroughly likeable chap - spoke enthusiastically about the thirties interior. Some of the leaded work - yes, he's right. But the rest - pure 1950's. I don't like to talk in superlatives. OK, I do. But this pub deserves them. One of a handful of bars I have visited (and god knows, I've visited a few) with a bonafide fifties décor. The 1950's became incredibly unfashionable, so everything got trashed. That's why such interiors are rare. As a big treat, when I was a kid, we were able to go into the lounge bar of the pub on our caravan site. Through the window, the dangerous, inaccessible public bar looked like this. The lounge of the Ram Hotel in Newark wasn't too disimilar, before it became a circuit pub. Many locations in my best beer-drinking dreams share design concepts with Krom. What more can I say? Literally, a pub of my dreams. What makes it perfect is the general shabiness. Brilliant. Coming in here, the fourth pub down (well, ones worth going in) from Frederiksplein, I couldn't help but smile. As I said, the barman was full of praise for his workplace. Good on him. That's half the battle won, in a pub, if the barstaff love where they work. The bar is a weird curvy veneer thing, that looks as sturdy as a Diana Dors filmset. But look at those beer taps. Do you remember that old French silent film of the Jules Verne story? Doesn't that chrome bullet look like the spaceship? And the old jukebox. Probably 1960's, but I can remember that sort of model from my youth. The Whip in Leeds - in its days as a Ted meeting point - had a more vintage one. A whacky thing that played the records vertically. Before I drift off, I'll remark upon the lovely leaded lights (alliteration is such fun). Restrained pastel colours, but dead good (that's wot me nootz sez). When I learn how to take photos better, you'll see it here for yourselves. I hope that the barman's enthusiasm is representative of the survival chances of this pearl in its current form. "I came accros your beerguide on the internet when I was looking for cafe Krom. Thanks for the compliments jou are giving. 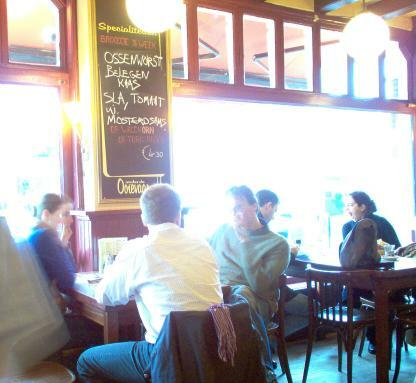 I work in cafe Krom for over 11 years now, and became the owner about a year ago. However, I have to correct you about a thing. The interior isn't from the fifties, not even from the thirties but originally from the twenties. The chairs are original Austrian thonet's (for your information: we are restoring them at the present time) and the neon light isn't yellow by itself (what was possible somewhere in the forties) but is white light in yellow painted glass. About the jukebox you're right, it's an AMI (American Music Industries) from 1959." Rating: **** Public transport: Tram 4. Food: Snacks, meals. La Chouffe �3, pils �1.50. 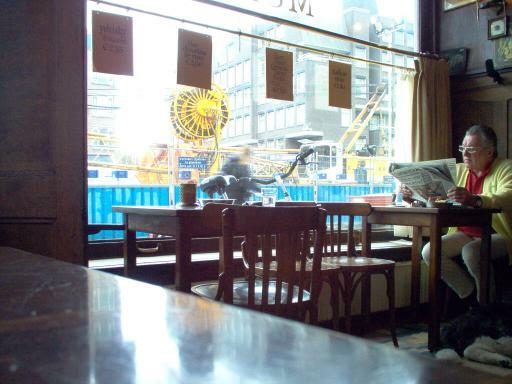 Will my work cataloguing Amsterdam pubs ever be complete? Not if I keep discovering new, pub-filled corners of the city. 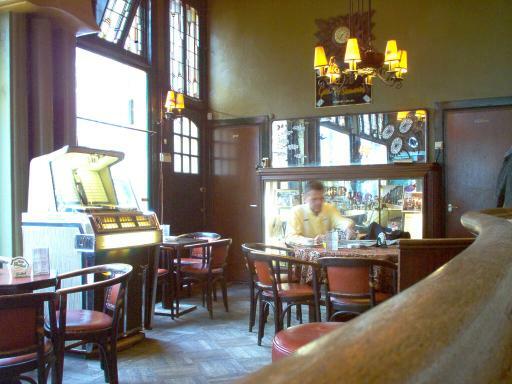 Koosje is an example of a pub containing elements of both a brown café and a rendy bar. And very welll it works, too. 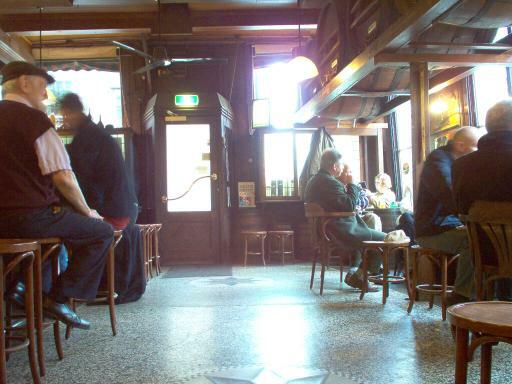 On the one hand there are the bare wooden boards and dark panelling of traditional Dutch boozers. Yet look a little higher and you'll see pale pastel colours and the odd restrained, tastefully framed print. 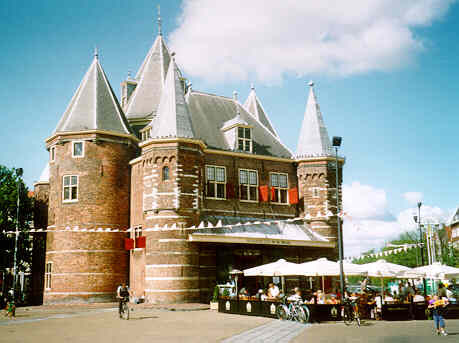 If you have kids in tow, Koosje is a good place to shelter after you dump them in the zoo. It's directly opposite the main entrance to Artis. The mass of theatre and concert posters betray the young and trendy nature of many who stop here for refreshment. Not so surprising, when you realise how close we are to an unlovely mass of modernist rubbish that houses much of the University of Amsterdam. The best I can say about the complex is that it's well-hidden from the casual visitor. Outside, there;s a decent number of seats, though many are a bit too pavement edge for my comfort. Nothing too weird or wonderful about the beer choice, though serving both Brand and Heineken pils is odd. They've got Chouffe so I don't have to spend long making my drink selection. How many pubs serve this beer in Amsterdam? Still not enough, if you ask me. Rating: *** Public transport: Tram 9, 14.